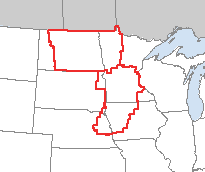 The areas outlined in red represent a Tornado Watch area that was just issued by the national weather service. The area covers portions of five midwest states. Tornadoes, 80 mile per hour winds and up to three inch hail possible in the Twin Cities. CAPABLE OF VERY LARGE HAIL...DAMAGING WINDS...AND A FEW TORNADOES. SPREAD ACROSS THE WATCH AREA THIS EVENING. Keep your eyes open. This could get interesting.